Recently, the Toronto Maple Leafs have unveiled plans to erect a statue saluting some of their legends in the form of 10 players jumping over the boards. 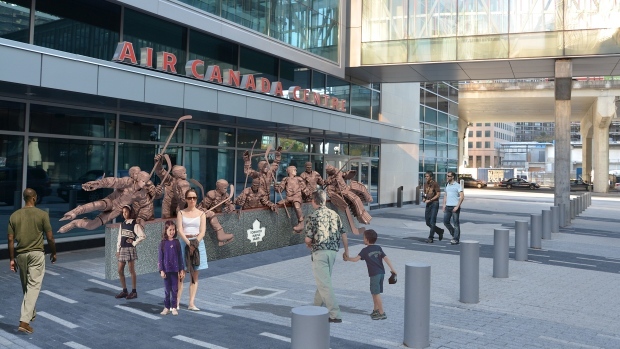 This statue will take its form in front of the Air Canada Centre where fans can reminisce of good times gone by. The man doing the sculpting, Erik Blome, has already done phenomenal stone work by doing Wayne Gretzky’s statue down in Los Angeles in front of the Staples Center. So at least it won’t be a laughing-stock. The Leafs have also revealed that Ted Kennedy will be the first of the alumni to be enshrined. Former captain and five time Stanley Cup champ, Kennedy was acquired by the Leafs in 1942 from the Montreal Canadiens. Retiring at the age of 30, he was inducted to the Hall of Fame in 1966. Seems like a no brainer pick with stats like that. When I was first presented the idea to my own version of the Legends Row, I realized it wouldn’t be fair for me to include players from the 50’s, 60’s and 70’s as I never lived through their greatness. While I’m fully aware of what players were phenomenal and how much they mean to Leafs Nation, it just wouldn’t be right to me. Which leaves me with a much shorter list to pick from but I’m down for the task. I’m also only going to name two that are a given. We already know the greatness of Mats Sundin, Curtis Joseph, Felix Potvin, Tie Domi, Darcy Tucker, and so on. After the first two names, it’s time to give some of the other guys who contributed a time to shine. I was born in the 80s. Get ready to take a slight trip back in time to some of the Leafs mediocre times. Before I start, this is just my personal list so don’t get bent out of shape for some of the players that are named. It’s also in no particular order. I’ll include honorable mentions at the end. Without further ado, picks one through five. Five through ten will be tomorrow! Some say the greatest player to wear #17 (*cough*Rod Brind’Amour would like a word. *cough*), Clark played his junior days out the WHL’s Saskatoon Blades who just seemed to breed hockey enforcers for a few years. Taken first overall by the Leafs in the 1985 NHL Entry Draft, Clark was one of the few who threw punches but had the hockey skill to back it up. 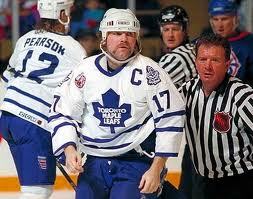 In his rookie year, he racked up 227 PIM and never backed down from the physicality that was needed from him. I say this as he wasn’t just known for throwing a few, he had an arsenal of body checks that could change the game’s momentum in an instant. Oh Dougy Gilmour, god love you. Fun fact; my earliest memories of hockey included seeing Doug Gilmour in cow printed spandex tights in honour of his “Got Milk?” campaign. It really was the 90s. Anyway, another obvious no brainer to add to the row. Gilmour played his junior years with my hometown Cornwall Royals and actually had the glorious oppourtunity of playing fastball during the summer here as well. Along with Dale Hawerchuk and Danny Daoust, the Royals became legendary for the Seaway City. Obviously Gilmour was destined to bigger things then just being a Cornwall celebrity. Drafted by St. Louis and after a minor stint with Calgary, Gilmour donned the white and blue of the Leafs starting in the 199-1992 season. A crucial asset to the team, Gilmour was another who didn’t let up. Who’s to say what could have happened if Kerry Fraser never missed the call on Gretzky in 1993. I’m not going to say anymore; I’m just going to leave this here. After the demise of the USSR, Russian players were suddenly on the market for the NHL in the beginning of the 90’s. While Borschevsky wasn’t a huge powerhouse with Dynamo Moscow, he started to get into his groove after being traded to Spartek Moscow in 1989. NHL scouts kept their eye on him for the next three years and took in his play at the 1992 Albertville Olympics in which he was a part of the gold medal winning squad. The Leafs gambled and picked him up in the 1992 NHL Entry Draft and it managed to pay off. Borschevsky exploded for almost a point a game in his rookie year and ended up second in team scoring; second only to Gilmour. Another crucial piece to that 1993 team that keep haunting the Leafs until the current group manage to reach the second round of the playoffs. It remains to be seen what could have been of Borschevsky if injuries didn’t get the better of him. After two solid years with the Leafs, his stock plummeted and he never regained his monumental performance. I think with him being of the first Russians to make a small dent in the NHL hockey world deserves a nod to my version of the Legends Row. He also belongs on here just because Steve Dangle named his pet bird Nikolai Birdchevsky. Brilliant. We all know the 2000s weren’t all that great to the Leafs however, there were a couple of rays of sunshine that stood out. Antropov was drafted 10th overall by Toronto in the 1998 Entry Draft. He came up full-time in the fall of 1999 and for the next 10 years, Antropov contributed solid numbers year after year after year. He’s one of the few was I’m devastated that the Leafs could never get on a roll and win something for. Playing on the same line as Mats Sundin would be no easy feat but Antropov did it with ease and proved that having solid wingmen is a daunting task. He kept up his stats when he was traded to the Thrashers/Jets and even managed to become a Canadian citizen in the meantime. He played last season with Barys Artana in the KHL. I should probably start up a Nik Antropov Fan Club. 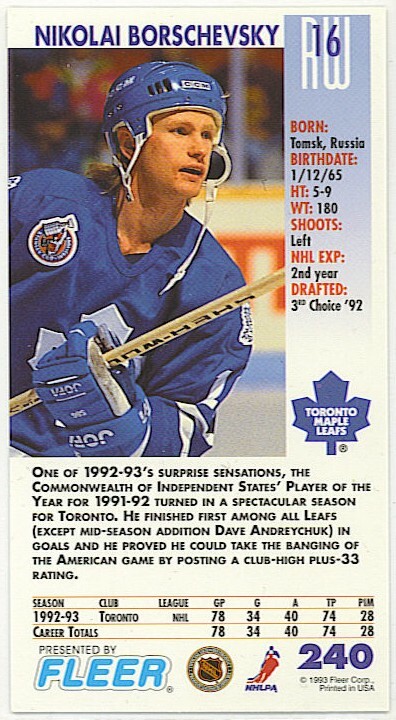 Another underrated player to lay in Toronto fandom, Berezin was selected 10th overall in the 1994 draft and after exploding with talent for the next two years in the DEL he finally headed over to North America. A pity that it was with the Leafs who I think at the time didn’t really know what to do with him or develop him into elite player status. He managed to be selected to the All-Rookie team in 1997 and managed a career high of 59 points in 1999. However after his second career high of 50 points (only 3 points behind Sundin), he was traded off the Phoenix for Mikael Renberg. Yeah, the worked out didn’t it. The knife in the back for the Leafs came when Berezin, now with the Canadiens, scored their 10,000th goal on home ice. Ouchie. However, five solid years with the Leafs through the crazy early years of the 2000’s puts him on my list. Honorable mentions for this half: Jonas Hogland, Peter Zezel, Freddy Modin, Igor Korolev, Garry Valk, oh and Nikolai BIRDschevsky.